The Superior Chess Set Combination includes a set of Triple Weighted Regulation Plastic Chess Pieces, Regulation Vinyl Chessboard (with 2.25'' Squares) and a Superior Chess Bag. Each combination consists of one set of Chess Pieces (which includes two additional queens), one chessboard and one bag. Available in Green, Black, Blue and Red! Brand New! Designed specifically for club, tournament and scholastic players, this combination includes a set of Regulation Triple Weighted Plastic Chess Pieces, as well as our US Chess- branded Premium Vinyl Chess Board and Quiver Chess Bag. Product Description The Quiver Chess Set Combination includes a set of Single Weighted Regulation Plastic Chess Pieces, Regulation Vinyl Chessboard (with 2.25'' Squares) and a Quiver Chess Bag. Each combination consists of one set of Chess Pieces (which includes two additional queens), one chessboard and one bag. 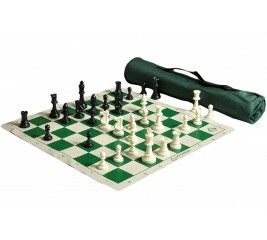 NOTE: Color selection indicates the color of BOTH  the Chess Bag and Chessboard  included in this combination set. Exception: Products with camo selections would come with closest matching color. The Superior Chess Set Combination includes a set of Single Weighted Regulation Plastic Chess Pieces, Regulation Vinyl Chessboard (with 2.25'' Squares) and a Superior Chess Bag. Each combination consists of one set of Chess Pieces (which includes two additional queens), one chessboard and one bag. Brand New! Designed specifically for club, tournament and scholastic players, this combination includes a set of Regulation Single Weighted Plastic Chess Pieces, as well as our US Chess- branded Premium Vinyl Chess Board and Quiver Chess Bag. Product Description The Drawstring Chess Set Combination includes a set of Triple Weighted Regulation Plastic Chess Pieces, Regulation Vinyl Chessboard (with 2.25'' Squares) and a Drawstring Chess Bag. Each combination consists of one set of Chess Pieces (which includes two additional queens), one chessboard and one bag. 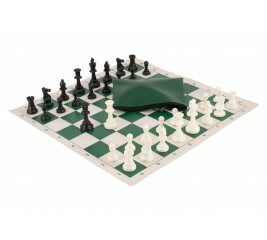 NOTE: Color selection indicates the color of BOTH  the Chess Bag and Chessboard  included in this combination set. Product Description The Standard Chess Set Combination includes a set of Triple Weighted Regulation Plastic Chess Pieces, Regulation Vinyl Chessboard (with 2.25'' Squares) and a Standard Chess Bag. Each combination consists of one set of Chess Pieces (which includes two additional queens), one chessboard and one bag. 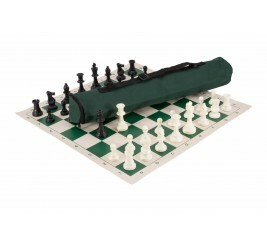 NOTE: Color selection indicates the color of BOTH  the Chess Bag and Chessboard  included in this combination set. 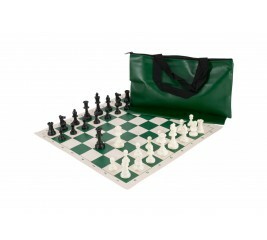 The Quiver Chess Set Combination includes a set of Solid Plastic Regulation Chess Pieces, Regulation Vinyl Chessboard (with 2.25'' Squares) and a Quiver Chess Bag. Each combination consists of one set of Chess Pieces (which includes two additional queens), one chessboard and one bag. NOTE: Color selection indicates the color of BOTH  the Chess Bag and Chessboard  included in this combination set. Exception: Products with camo selections would come with closest matching color. Product Description The Basic Chess Set Combination includes a set of Triple Weighted Regulation Plastic Chess Pieces, Regulation Vinyl Chessboard (with 2.25'' Squares) and a Basic Chess Bag. Each combination consists of one set of Chess Pieces (which includes two additional queens), one chessboard and one bag. 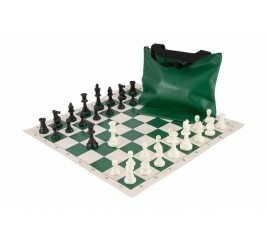 NOTE: Color selection indicates the color of BOTH  the Chess Bag and Chessboard  included in this combination set. 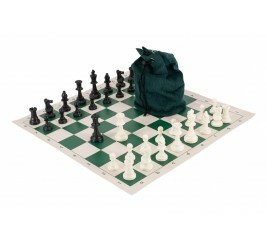 The Drawstring Chess Set Combination includes a set of Solid Plastic Regulation Chess Pieces, Regulation Vinyl Chessboard (with 2.25'' Squares) and a Drawstring Chess Bag. Each combination consists of one set of Chess Pieces (which includes two additional queens), one chessboard and one bag. NOTE: Color selection indicates the color of BOTH - the Chess Bag and Chessboard -included in this combination set. Product Description The Drawstring Chess Set Combination includes a set of Single Weighted Regulation Plastic Chess Pieces, Regulation Vinyl Chessboard (with 2.25'' Squares) and a Drawstring Chess Bag. Each combination consists of one set of Chess Pieces (which includes two additional queens), one chessboard and one bag. NOTE: Color selection indicates the color of BOTH - the Chess Bag and Chessboard -included in this combination set. Product Description The Standard Chess Set Combination includes a set of Solid Plastic Regulation Plastic Chess Pieces,Regulation Vinyl Chessboard (with 2.25'' Squares) and a Standard Chess Bag. Each combination consists of one set of Chess Pieces (which includes two additional queens), one chessboard and one bag. NOTE: Color selection indicates the color of BOTH  the Chess Bag and Chessboard  included in this combination set. Product Description The Standard Chess Set Combination includes a set of Single Weighted Regulation Plastic Chess Pieces,Regulation Vinyl Chessboard (with 2.25'' Squares) and a Standard Chess Bag. Each combination consists of one set of Chess Pieces (which includes two additional queens), one chessboard and one bag. NOTE: Color selection indicates the color of BOTH  the Chess Bag and Chessboard  included in this combination set. Product Description The Basic Chess Set Combination includes a set of Single Weighted Regulation Plastic Chess Pieces, Regulation Vinyl Chessboard (with 2.25'' Squares) and a Basic Chess Bag. Exceeds all US Chess Federation and FIDE requirements for Official Tournament Use! NOTE: Color selection indicates the color of BOTH  the Chess Bag and Chessboard  included in this combination set. 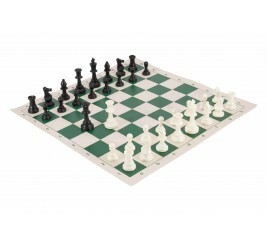 Product Description The Basic Chess Set Combination includes a set of Solid Plastic Regulation Plastic Chess Pieces, Regulation Vinyl Chessboard (with 2.25'' Squares) and a Basic Chess Bag. Exceeds all US Chess Federation and FIDE requirements for Official Tournament Use! NOTE: Color selection indicates the color of BOTH  the Chess Bag and Chessboard  included in this combination set.